Usually towards the end of post-processing of an image, an astrophotographer tends to want to perform enhancements to colour saturation in order to make colours more eye-popping. Those dealing with narrowband images may also wish to tweak their image's colour palette further in order to give precisely the colours they want, no matter what their starting palette was (Bicolour, Hubble​, etc). This tutorial goes over how to selectively tweak the saturation level of particular colours in your images as well as how to make overall enhancements to colour saturation. Moreover, this tutorial also covers how to perform a hue shift - to turn a set of colours into a different set of colours, or different shades of the same colour. This is particularly useful for those dealing with narrowband images. The processes covered for all this are ColorSaturation and CurvesTransformation​. ​It is commonplace to want to enhance colour saturation in certain areas of one's images, particularly toward the end of post-processing. 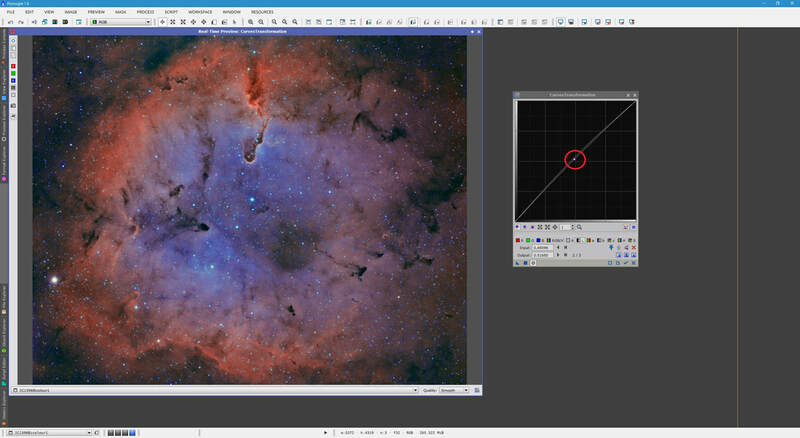 This is usually when the image is non-linear and has already been through a number of post-processing procedures. 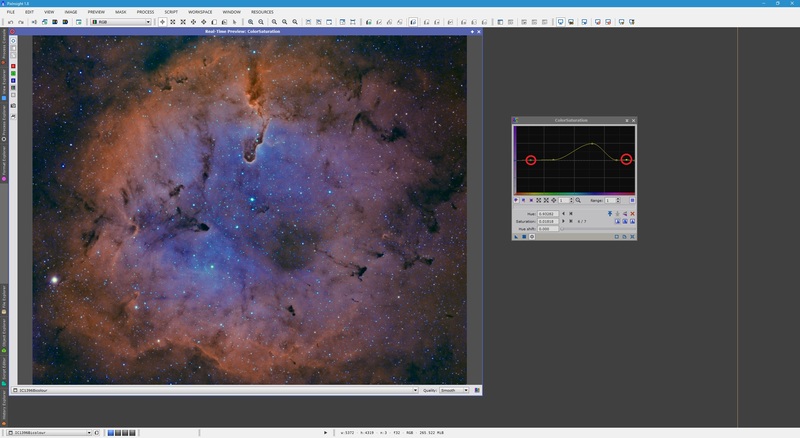 Take the following narrowband Bicolour Palette image of the Elephant Trunk Nebula, for example. ​One may wish to produce deeper-looking blues, for example. Use of masks is optional, as you could for example use a star mask to protect the stars from the colour saturation enhancements. For this example, I will not bother with masks. The above shows the non-linear image open alongside the ColorSaturation process. This process allows us to saturate particular colours to different extents. The horizontal yellow line displayed in ColorSaturation is by default flat at a Saturation value of 0.00000. As a result, nothing is being done to the image at present. We first need to determine more or less where are blues lie within the colour spectrum. For this, we simply click on the image, leaving the left mouse button pressed down, and hover the mouse pointer over an area of interest (that we would like to saturate more). ​The crosshair that pops up in ColorSaturation indicates that our area of interest lies in that area of the colour spectrum. 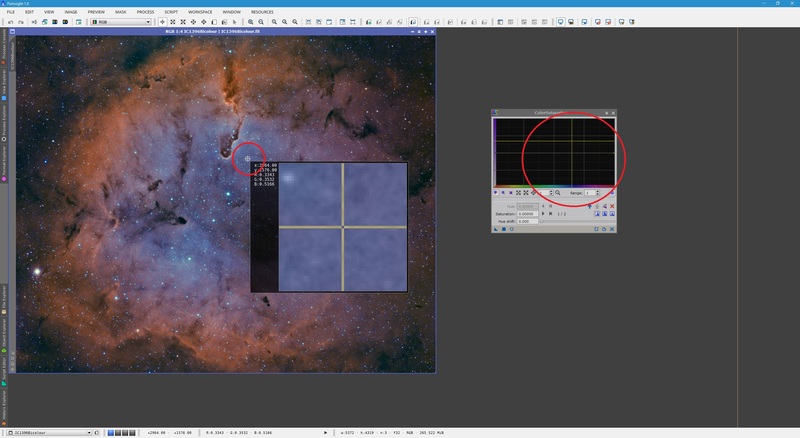 Therefore in order to enhance colour saturation for those colours in the image, we click on the graph in ColorSaturation above the colour range we are interested in. We also enable the Real-Time Preview so we can see what is happening as we make adjustments. Clicking has created a point that curves the line upwards, peaking more or less where we clicked. We can make further adjustments to this curve so that it only really enhances colour saturation around the blues. For this, we click to create more points along the colour spectrum that flattens the curve in these places. ​​To remove the remaining minima in the curve (which reduces saturation in those colours), we click to create a couple more points (where the minima are located). If you make a mistake and add a point where you did not want to add one, you can simply click and drag it to move it elsewhere. If you want to delete the point, simply click the point itself while keeping the CTRL​ key pressed on your keyboard. ​Now that there is only one peak in the curve, located above the blues, and the rest is more or less flat, we can refine the curve further to make sure it does precisely what we want. For example, my curve above is clearly enhancing more than just the blues, so we move the peak's left point towards the right to further restrict the enhancement to the blues only. To move a point, simply click and drag it anywhere desired. ​With the curve now looking more like what we want, we ensure that the rest of the points that should provide zero saturation enhancement, really do provide zero saturation enhancement. We can essentially navigate through each individual point using the left and right arrow buttons on ColorSaturation. After a point is selected, we are shown its current Saturation value. A value of 0.00000 provides no saturation enhancement. A positive value increases saturation. Conversely, a negative value decreases saturation. ​All we need to do is click the left arrow several times so that we have the first point selected. In my case, since there are 7 points, ColorSaturation now states 1 / 7 so my first point is definitely selected. Checking the Saturation value, it says 0.00000, which is what I want for those colours. Now I click the right arrow once so that ColorSaturation states 2 / 7 (my second point is selected). ​The value of Saturation at this second point appears to be 0.00909. It was my intention such that this should be 0.00000 as I do not want to enhance saturation in these colours. Therefore, I simply modify the Saturation value to 0.00000 and press the TAB button on my keyboard (or click another text box in ColorSaturation​) to ensure the changes are applied to the point selected. ​The second point is now not enhancing saturation at its location. 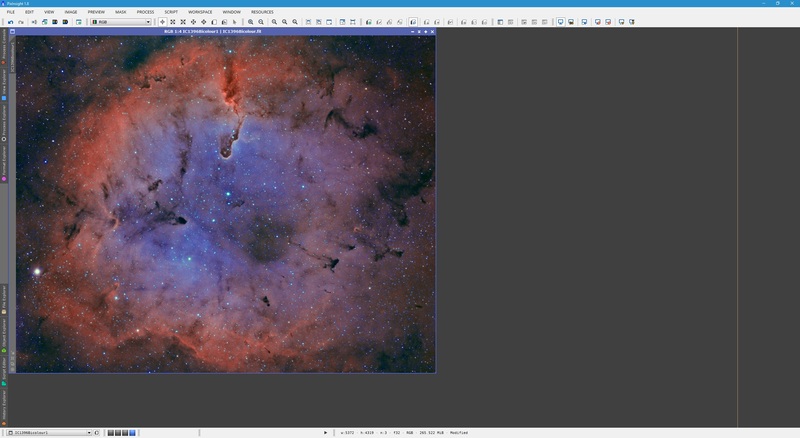 All that is left to do is click the right arrow once more (to move to point 3 / 7) and do the same - make sure Saturation is at 0.00000 if the point selected does not correspond to my desired peak on the blues. The following shows the end result of doing this to every point except 4 / 7, which happens to be the peak point over the blues. All that is left to do is ensure that indeed this is the amount of enhancement we wish to perform on the blues in my image. Since I have the last point selected at present (7 / 7), I click the left arrow button until I reach the peak point (4 / 7). Its current Saturation value is 0.49091​. ​Though the blues are deeper, it might be a little too much in comparison to the rest of the image. Since we will make universal colour saturation enhancements later, we can afford to saturate the blues a bit less at this stage. Therefore, I simply decrease Saturation for this point to 0.30000 and press the TAB key on my keyboard (or click any other text box in ColorSaturation) to the changes are applied. You can click the Real-Time Preview button on ColorSaturation to toggle the preview on and off. The window will stay open displaying the image, except if you toggle it off, it will show you the original image (without any colour saturation enhancement applied). Therefore toggling it on and off will give you a before and after picture so you can check to see if you are happy with the changes proposed. You can adjust your Saturation value further to taste, or add another peak elsewhere, or reduce the saturation in a particular colour by adding a minimum point below the flat line. Once you are happy with your changes, click the Apply button. Remember that the Real-Time Preview will then show you what it would look like if you applied the same enhancement again (a second time). Therefore, to see what you image looks like now, simply click the Reset button on ColorSaturation (alternatively, if you want to keep its settings, simply move the Real-Time Preview window out of the way, or close it). ​Above, I closed the Real-Time Preview window to see the image after applying ColorSaturation to it. With the blues as deep as I want them for now, I close ColorSaturation and move on. 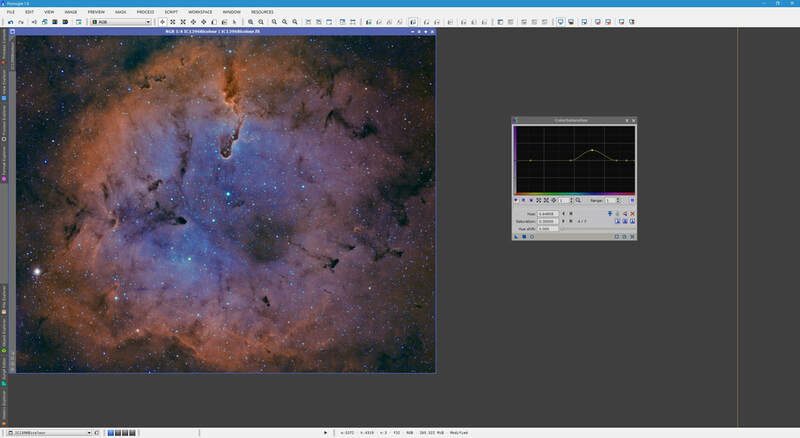 ​As is common with narrowband images, given their false colours, it is up to the user to choose the colour palette they want to give their image. PixelMath combinations of narrowband data gets you to rough combinations that produce the colour palette you like, but at times minor adjustments are desirable. For example, I may want to make the oranges in my images redder, so that the image takes more of a red-blue colour palette as opposed to an orange-blue colour palette. The objective merits what we call a hue shift​. The above shows my image after it received the ColorSaturation enhancement to the blues in the previous section. It is open alongside the CurvesTransformation​ process. To perform a hue shift, we switch to Hue​ mode. We also open the Real-Time Preview​ window, as before. ​Before we begin, we note that there is already a straight line going across CurvesTransformation. On the horizontal and vertical axes, we have the entire colour spectrum. The fact that the line is straight means that each colour corresponds to itself, i.e. there is no hue shift at the moment. My aim of making the oranges redder requires I shift the line so that the oranges are shifted towards the reds. We also note that the horizontal axis is the FROM axis and the vertical axis is the TO axis. For example, if we place a point above the blues on the horizontal axis and move it up to the purples along the vertical axis, the blues will be come purples. Therefore, to perform the hue shift of oranges to reds, I click to make a point on the graph above the oranges on the horizontal axis, but place the point far down the vertical axis so it corresponds to the reds on the vertical axis. If you want to find out where certain colours in your image appear in the colour spectrum, simply click and keep the left mouse button pressed over that area of the image. The same crosshairs that appear in ColorSaturation will appear in CurvesTransformation​, helping you identify the colours you are aiming at. This has clearly made a hue shift on our image, making the oranges redder, as desired. Unfortunately, due to the curvature introduced in CurvesTransformation, it is shifting the rest of the colours as well. The blues are made lighter blues, for example. To rectify this, we simply click to create a number of extra points along the curve to straighten it after the orange-red hue shift. ​At this point, you may want to add a number of extra points to straighten the line further, or to perform a bit of a hue shift elsewhere in the colour spectrum. You may also want to move the first point created to give you precisely the colour shade you want. If you create a point you would like to delete, simply click it while keeping the CTRL key on your keyboard pressed. ​Above, I have adjusted the oranges and yellows somewhat further to produce a nicer shade of red that is somewhat less intense. I have also created a point above the blues and dragged it upwards to make the blues a little bit darker. You can click the Real-Time Preview button on CurvesTransformation to toggle the preview on and off. The window will stay open displaying the image, except if you toggle it off, it will show you the original image (without any adjusment applied). Therefore toggling it on and off will give you a before and after picture so you can check to see if you are happy with the changes proposed. ​When you are happy with the changes proposed, simply click the Apply button. Make sure you then click the Reset in order to see your image as it is after the adjustment, or move/close the Real-Time Preview window. 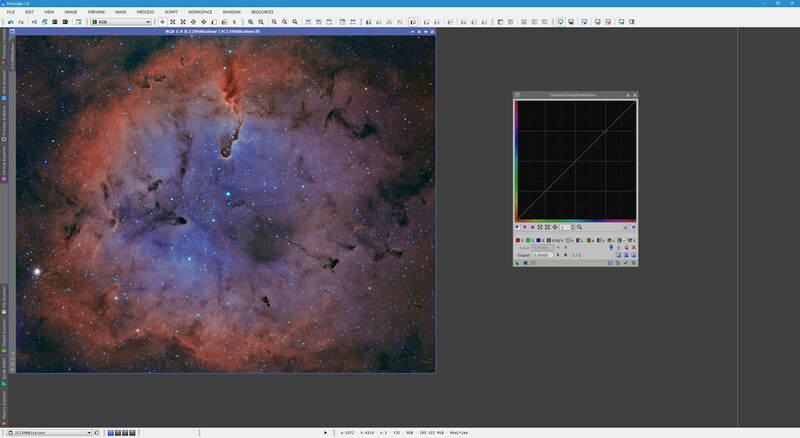 We will now saturate all the colours in the image further. Though we can simply do this by increasing the value of Saturation in ColorSaturation on the default two points that make the straight horizontal line, we can also do it here in CurvesTransformation. Simply go to Saturation mode and make sure the Real-Time Preview​ is active. Since the horizontal axis is the FROM axis and the vertical axis is the TO axis, as before, to enhance overall colour saturation, we simply click to create a point in the middle of the straight line and drag it upwards towards the top-left corner of the graph. A small adjustment makes a big difference so be conservative here. ​Conversely, if you want to overall desaturate the colours a little, simply drag this new point downwards towards the bottom-right corner of the graph. Since colours are displayed in tandem with lightness, you may want to make a minor adjustment to image lightness as well. This is done in Lightness​ mode. ​The same theory applies here. Click to create a point in the middle of the graph and then drag it upwards towards the top-left corner of the graph to increase lightness. Conversely, drag it downwards towards the bottom-right corner of the graph to decrease lightness. Again, you will need to be conservative here. ​Below, I give my image a bit of a boost to lightness. Since I have not yet applied either the colour saturation enhancement or the lightness enhancement, both curves are displayed in CurvesTransformation (though they are very close together in my case). Once you are happy with your proposed changes, click the Apply button. Remember that the Real-Time Preview window will then show you what it would be like if you applied the changes again (a second time). To see your image as it is, click the Reset button or move/close the Real-Time Preview window. You may close the CurvesTransformation process once you are done applying changes. You may want to make a second adjustment once the first adjustment is applied, however. It is not uncommon to repeat this once more, though usually less aggressively. Following everything, your image should produce the colours you want to represent, with the level of intensity you desire. 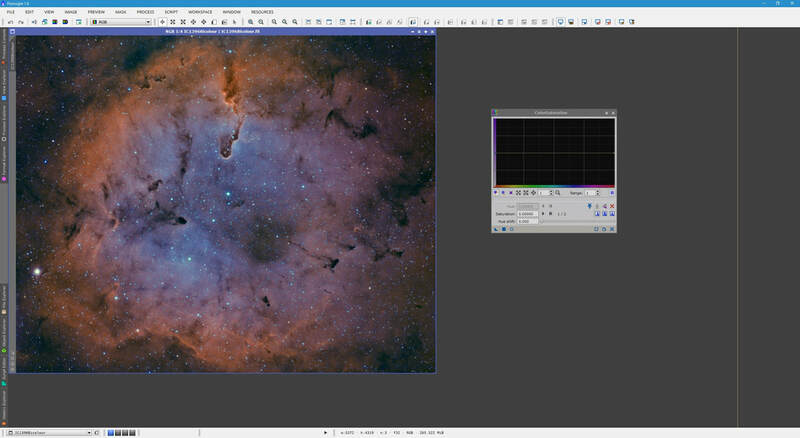 This procedure is particularly useful for tweaking the colour palette and colour fidelity in narrowband images.